CHATELAIN -Nouvelle carte de l'Asie avec des tables..
CHATELAIN,H. - Nouvelle carte de l'Asie avec des tables..
Nouvelle carte de l'Asie avec des tables.. - CHATELAIN,H. Size : 18.3 x 22.9 inches. / 46.5 x 58.2 cm. 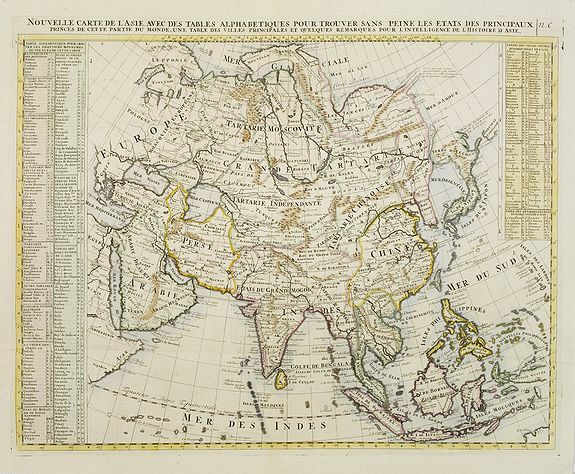 Description :Chatelain's map of Asia. The title is in two lines across the map. On each side border appears an index to the map's contents. From Chatelain's Atlas Historique et Méthodique . From the German edition of Prevost's "L'Histoire Générale des Voyages" by J. J. Schwabe in Leipzig. Condition : Repair of a tear, on crossing of horizontal and vertical fold, in lower part map, else in very good condition.